Fig. 209.—The die should be kepi well lubricated with lard oil or a threading oil. makes the die turn easier, cut smoother threads, and hist longer. Fig. 210.—Tapping threads in a hole. A. Care must be u*ed to start the tap straight into the hole. Use one hand, prewiriK straight against the top of the tap, and turn slowly with a wist motion. jB. Once the tap is well started, «top and oil it with lard oil or threading oiL C. Then turn steadily by applying equal pressure with both hands. The hole must be drilled somewhat smaller than the size of bolt to be screwed into the hole, usually 3^6 in- smaller for bolts from K to in. in size. 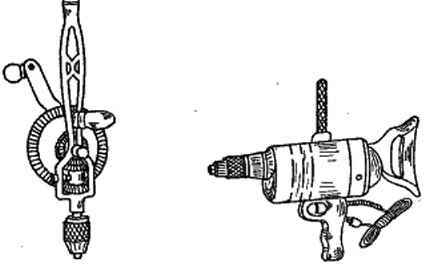 Probably the best method to determine the exact size of drill to use is to refer to a table, such as Table V. In the absence of such a table, a hole somewhat smaller than the bolt may be drilled in a piece of scrap material, and the tap tried in it. 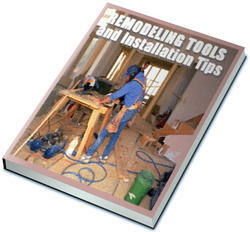 If the hole does not prove to be the proper size, a drill a size larger or smaller should be used. A taper reamer can be used to easily and quickly enlarge a hole that is too small. After a hole of the correct size has been drilled, the tap is placed in the hole and pressure applied as the tap wrench is slowly turned. Care must be used to get the tap started straight into the hole. 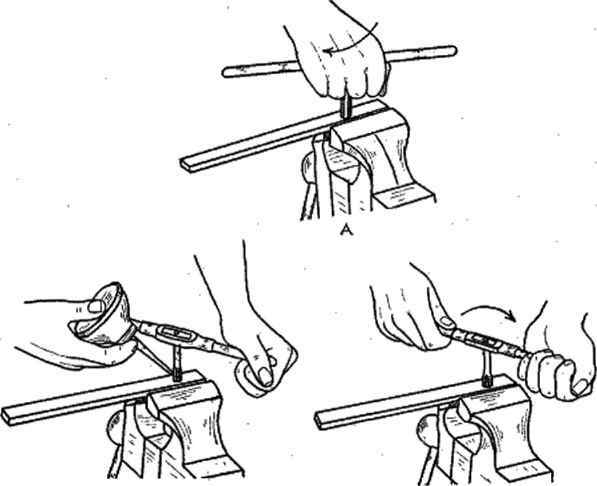 A good way is to use only one hand until the tap starts, pushing firmly with the palm against the center of the tap wrench, and giving it a slow twist with the wrist. After the tap starts, the pressure is released and the turning is done by using a hand on each end of the tap wrench, being careful to pull with equal force with each hand. Lard oil or threading oil should be used on taps as on other cutting tools when working in steel. 236. Tapping Threads in a Blind Hole.—Where threads are to be tapped in a hole that docs not go entirely through the stock, a regular taper tap may be used to cut threads as far as it will go. A plug tap, which has a blunter and less tapered end, is then used to cut threads nearly to the bottom of the hole. If threads are to be cut all the way to the bottom, a bottoming tap, which has little or no taper on the end, is then used to finish the work. 237. Making a Bolt.—A very simple way to make a bolt is to cut off a rod to the desired length, thread both ends, and screw on nuts. With a small assortment of nuts, and a few different sizes of rods, one can easily make a bolt for almost any occasion or emergency. Moreover, the bolt is practically as good as a bolt that is bought and usually just as cheap or cheaper. If desired, one of the nuts may be riveted onto the rod to prevent loosening. 1. Taper the end of a rod slightly before starting the die. Use a file, a hammer, or a grinder. 2. Start, a die or a tap slowly and carefully and get it straight. 3. Use equal pressure on the handles of the stock or tap wrench. 4. Always use lard oil or a threading oil when threading steel. It will make the tool cut easier and smoother and last longer. 5. Taps and dies should not be backed up until the thread is completed. 6. If chips and cuttings tend to clog the tool, remove them with a small nai! or wire or piece of wood. 7. Bo sure the proper size of hole is drilled before topping. % A hole that is too small can be easily and quickly enlarged with a taper reamer. 8. A bolt is easily xnade by threading both ends of a rod and using nuts on both ends. 9. Remove the cuttings and wipe off excess oil before putting taps and dies away. 231. (a) What different kinds of threads arc used on farm machinery and equipment? (6) What are the chief differences between these kinds of threads? 232. What sizes and kinds of taps and dies should be included in the farm shop equipment? 233. How may the number of threads per inch on a bolt be determined? 234. (a) What important points should be observed in threading a bolt or rod? (6) Why should lard oil or threading oil be used on taps and dies? (c) What is a common cause of rough or torn threads? 236. (a) Flow may a workman determine the proper size of hole to drill to receive a tap? (6) Explain and l>e able to demonstrate a good method of starting a tap straight in a hole. 236. (a) What is meant by tapping threads in a blind hole? (b) Just how is this done? 237. 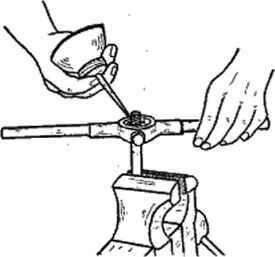 (a) Describe a simple method of making a bolt from a short rod. (6) What particular advantage does this method have? Boss, Dent, and White: "Mechanical Training." Van Lkuvkk; "Cold Metal Work." Tustison and Kkanzusch: " Metalwork Essentials." Radebatjgh: "Repairing Farm Machinery and Equipment." Burqhardt: "Machine Tool Operation." Part I. Sharp and Sharp: "Principles of Farm Mechanics."